It’s one of those geographic and historic terms that evokes so much in the imagination. Cowboys and Indians. Canyons and deserts. In a 21st Century sense it could mean the bottom of the ocean or deep space. Star Trek refers to space as “the final frontier” and Alaska’s state motto is “the last frontier.” Wherever you’re talking about, if it’s a frontier, then it means you’re on the edge where the lines of society and civilization start to blur with nature and survival. There is an allure to the frontier even if there is a danger. Modern Americans have no real concept of it which is amazing when you consider our great-grandparents were alive when it still existed. Let’s take Texas for example. I have this strange fascination with West Texas along with the other extremities of the state. I don’t think I’m alone in this thinking. I don’t know the exact number but I’d be willing to say 70-80 percent of all Texans live in the Texas Triangle. The Texas Triangle being the shape that roughly follows I-45, I-35 and I-10 and contains Houston, DFW, Austin, San Antonio and smaller cities like Bryan-College Station or Waco. For that sheer number of Texans that all live and work within five hours of one another, the extremities of Texas like El Paso and Amarillo have a certain romanticism. Far West Texas is Big Bend, Guadalupe Mountain, El Paso, the Marfa lights, Balmorhea and the Davis Mountains. East Texas is blanketed with forests, alligators and sometimes you’re not sure where Texas end and Cajun country begins. The Valley is where Mexico begins, it votes Democrat, looks subtropical and you know you’re headed that way when Corpus Christi ends and the drug checkpoints begin. The Panhandle is a land as flat as it comes filled with Red Raiders and sudden canyons. These are historically remote lands where boundaries and the law blur in their own way and they’ve been that way for centuries. That blurred line between Texas and Louisiana existed between French Louisiana and New Spain and manifested as the Sabine Free State, an unofficially official neutral strip of land between the American and Spanish frontiers from 1806 to 1821. Naturally, the bayous and tall pines of the trans-Sabine attracted criminals, deserters, and all kinds of outlaws. This is the land where the Redbone peoples come from. Far West Texas and the Valley were disputed until 1848 when the Treaty of Guadalupe-Hidalgo between the U.S. and Mexico settled that matter. Even before then, isolated Spanish missions dotted the banks of the Rio Grande like imperial islands in a sea of arid wilderness and Apache warriors. El Paso had a greater connection to New Mexico during the Texas Revolution than to any Texian lands. It wasn’t until the Compromise of 1850 between slave and free states that El Paso officially became a part of Texas. On the high plains, the Texas Rangers clashed with Comanches and very slowly the region was settled. Yoakum County, on the border with New Mexico, was the last county created by the Texas Legislature from the old Young Territory (which together with Bexar Territory comprised the Indian dominated lands of the Panhandle and West Texas to the Pecos River) in 1876. Even then, Yoakum County did not officially organize until 1907; 71 years after Texas gained its independence. You probably know about the goal Alisha and I have about seeing every national park. While that does not extend to every unit in the national park service, we try and get to as many of these smaller sites as we can when we pass through an area. Recently, we went to Lubbock for a weekend to visit a friend. We had two options for the drive back to Oklahoma City. The first was to take the direct route through Wichita Falls and Lawton, which would take five hours. Our second option was to go north, through Amarillo, and see some of the most isolated sites in the system. That isolation is ironic when you consider that so much of the region is smack in the middle of the country. The Panhandle, Oklahoma, Kansas, southern Nebraska and Eastern Colorado are about as close to the heart of the country as you can get but when you are out there you can feel the isolation. It’s the type of isolation that only hits you when you realize that Amarillo is the closest “big city” for chunks of five states. For most, this is fly-over (or drive-through) country. It seems endless and it all blurs together. Surely nothing of note ever happened there and nothing of interest remains. Even in history class, the two times they mention the region was when settlers crossed it in covered wagons to get to the good stuff on the Pacific coast, or when nature itself rejected agriculture and settlement through the Dust Bowl. As you drive north of Amarillo you can’t help but wonder just what exactly was out here that was worth making a national park unit? Then the flatlands of the Great Plains give way to the relentless power of water where the Canadian River has carved red cliffs and breaks into the windswept Earth. 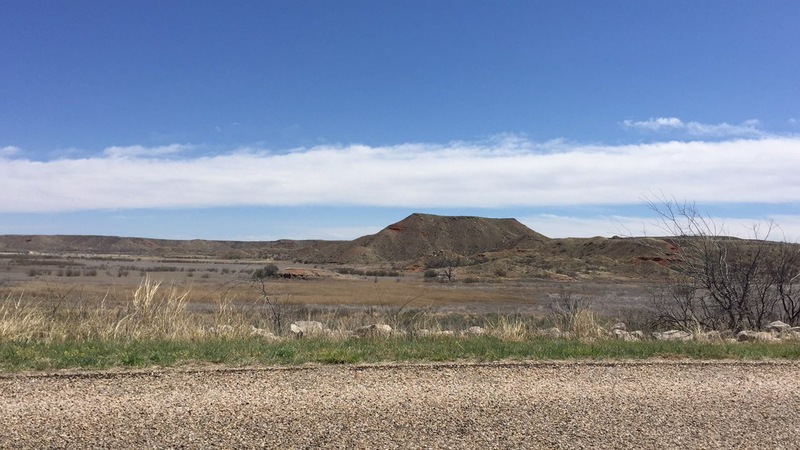 Like Palo Duro Canyon and Caprock Canyon to the south, Lake Meredith National Recreation Area is another example of what thousands of years of floods, storms and the flow of water can do even in the middle of nowhere. From this river valley an oasis blooms from the shortgrass prairies seen elsewhere in the region. Willows, mesquites and cottonwoods grow along the banks of the shallow river and narrowleaf yucca, prickly pear cacti, Indian blanket and other wildflowers paint the red hills. Innumerable white and gray rocks litter the hillsides. You will not find exotic wildlife in the small park but the animals are typical of the southwest: white-tail and mule deer, bobcats, herons, turkeys, rattlesnakes and horned frogs all call the river valley home. 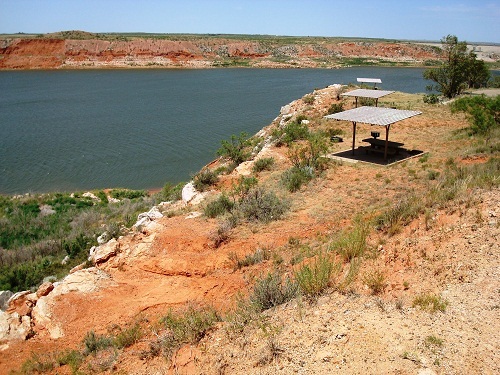 Established in 1990, Lake Meredith is a relatively new park unit. It expanded on an existing unit known as the Alibates Flint Quarries that was established in 1965, the same year the Canadian was dammed near Sanford to create Lake Meredith. The lake’s depth has fallen significantly since 1973 but it still provides a popular site for boaters and anglers while its banks and hills provide trails for hikers and mountain bikers. Hunters can still obtain permits to pursue the turkeys that congregate along the banks of the Canadian. Okay the geology of the place is kind of interesting but isn’t this just a baby Palo Duro Canyon? To an extent, that is correct. What I didn’t realize when we hiked Palo Duro was just how much history was lurking in those canyons. At Alibates, geology and the ancient history of the Great Plains intersect in a way I had never considered. 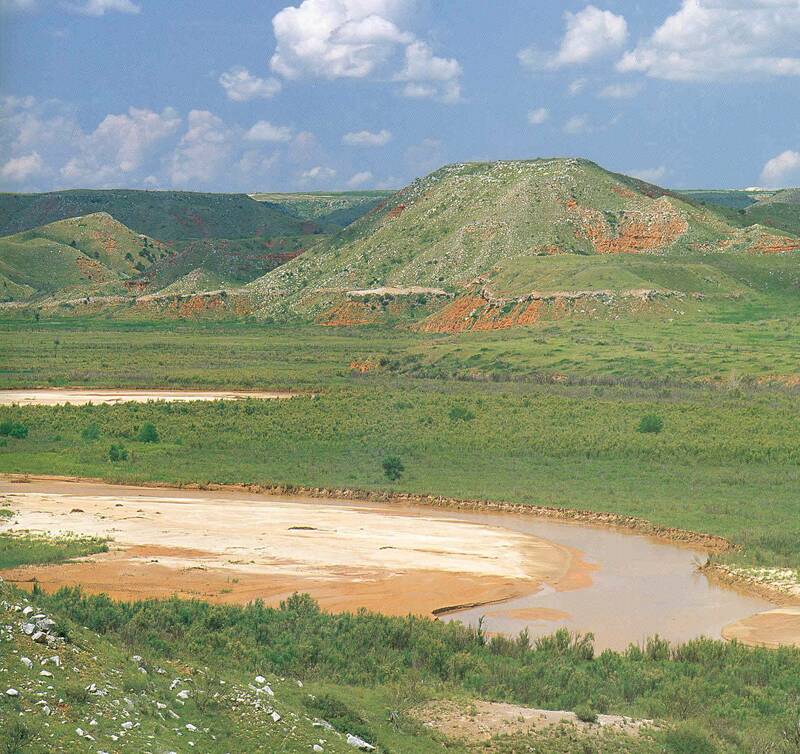 The smaller Alibates unit protects the alibates flint deposits that had been exposed by the erosion from the Canadian River. Floyd V. Studer, an archeologist from Canadian, Texas, discovered the site in his youth and was instrumental in its eventual preservation. At the end of the last ice age, natives dug up the valuable flint to create spearheads. These flint spears, which are actually an agatized dolomite and easily shaped, were perfect for hunting bison, mammoths and the giant sloths that inhabited the Paleolithic Great Plains. Archaeological evidence from the Blackwater Draw (where a 13,000 year old mammoth kill was discovered) site in New Mexico demonstrates that alibates flint was prized by the peoples of the ancient Clovis culture. In the decades before Columbus’ arrival in the New World, the Antelope Creek people constructed a settlement along the Canadian to quarry the flint. 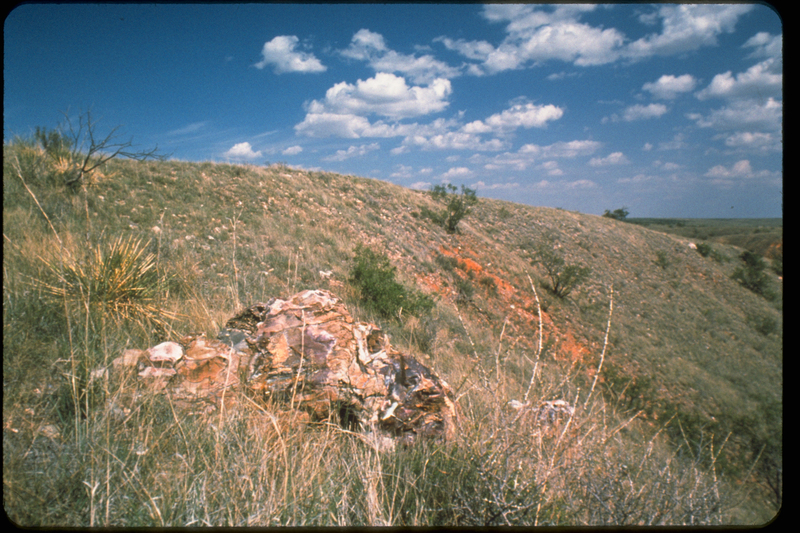 Anthropologists believe the Antelope Creek peoples were a semi-settled culture that inhabited the Texas and Oklahoma Panhandles. They likely arose from a predecessor culture that had been in the Panhandle since 400 A.D. Studer, the discoverer of the Alibates site, discovered 200 panhandle pueblo sites in addition to Alibates. The Works Progress Administration uncovered the ruins in the 1930’s. Petroglyphs, pottery, spearheads, pipes and jewelry have all been found around Alibates. In turn, alibates flint has been found in locations as distant as central Mexico, the Mississippi River valley and Montana. The flint spearheads were prized and likely traded across much of central North America for centuries. Whether or not Alibates itself was a center of trade is unclear but judging by the size of the Antelope Creek ruins it is doubtful that any major trade center ever developed. By 1500 A.D., a combination of drought and the arrival of Apache groups ended the Antelope Creek’s predominance in the area. Anthropologists believe the Apache migrations uprooted them and they migrated northeast where they merged with Caddo peoples. Regardless, the archaeological significance of the site convinced enough people to call for protection in the 1960’s. Senator Ralph Yarborough and Congressman Walter Rogers carried the legislation that established Alibates Flint Quarries as the first national monument in Texas. Standing at Alibates after learning this you realize two things. Firstly, all of those gray and white rocks, strewn every which way, are the result of millennia of flint quarrying by ancient people. Secondly, only in a place like this could any kind of settlement make it out on the plains. Between migratory buffalo, constantly shifting tribal territories, and lack of access to consistent water supplies it is no wonder that permanent settlement struggled to gain a toehold on the Great Plains. Only in a place like Alibates or Palo Duro or Caprock Canyon was there reliable water, food sources and defensible terrain to allow some kind of permanent settlement. It makes sense that the breaks and short canyons of the Panhandle would be the ideal location to settle, especially at Alibates where there was a readily available resource for trade. To a modern Texan living and working in the pines of Houston, the northern Panhandle seems like a distant land. To an ancient spear maker, Alibates makes sense to be the center of everything and who in their right mind would live on a hurricane swept coast amongst swamps and pines? 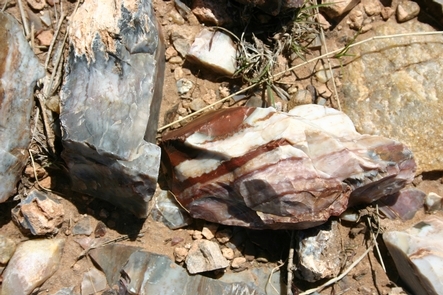 Lake Meredith and Alibates complement each other and reveal much about North American prehistory. But the history of the Great Plains in the area doesn’t end there. Two hours to the east in Oklahoma, a third national site protects a very different era of Native American history. Washita Battlefield National Historic Site preserves the site of the November 1868 battle between George Custer’s 7th U.S. Cavalry and Black Kettle’s Southern Cheyenne who were camped for the winter along the banks of the Washita River. If you’ve ever been to Gettysburg or a civil war battlefield you know those sites are massive. Washita is tiny, maybe 2,000 feet from the road, across the Washita River and to the back fence line. There are par five holes longer than this battlefield. When you drive up to it, it takes you by surprise with how innocuous it looks. Incessant winds blow the short prairie grass next to a short trail that takes you down to the Washita River. From the parking lot, you can be on the brown water in five minutes. What historical event could possibly take place in the middle of nowhere Oklahoma on a battlefield the size of a big box store? The prelude of the battle, if it can be called that, can be traced back to the same event that sent the Antelope Creek peoples from the Panhandle region and into Caddo territories to the northeast: migratory disruption. The Apache people arrived in the southern Great Plains in the 1500’s. The Comanche peoples broke off from the Shoshone in Wyoming and migrated to the southern Great Plains by the early 1700’s. By the 1800’s white settlers were crossing the plains towards the West Coast and increasingly settling the Mississippi and Missouri River Valleys. With numerous other tribes in the area already, conflict quickly broke out. Constant raiding began between the tribes and the white settlers. The creation of Indian Territory, and the removal of eastern tribes into this region, only exasperated the situation. The 1851 Treaty of Fort Laramie divided the Great Plains between the Cheyenne, Sioux, Arapaho, Crow, Assiniboine, Mandan, Hidatsa, and Arikara Nations. Even then, this treaty failed to include the Comanche, Kiowa, and Kiowa Apache as Fort Laramie was in Sioux territory and those tribes considered the Sioux an enemy. The Fort Laramie treaty only resolved the situation for so long. In the 1850’s three events began to exert increasing pressure on the regional tribes: the settlement of Kansas, the Texas Rangers’ war against the Comanche over the Texan frontier, and the settlement of Colorado Territory by fortune seekers after the discovery of gold. The 1861 Treaty of Fort Wise moved the Cheyenne and Arapaho to a small reservation on the Arkansas River to avoid conflict with Coloradan settlers. From 1861 to 1865, the United States focus was on the Civil War, though the status of Indian Territory during the war is a subject worth its own blog post. 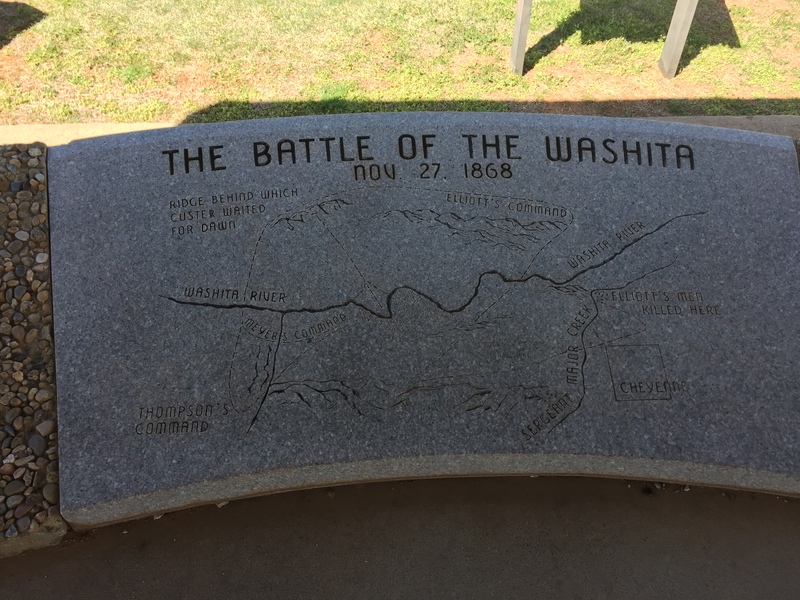 Regarding the long build up to the Battle of Washita, the Colorado War, fought between 1863 and 1865, is critical. Chivington was spared criminal charges due to the post-Civil War general amnesty but his political career was destroyed. He spent his remaining years drifting between various states and business pursuits before dying in 1894. He stood by his decisions at Sand Creek until the end. 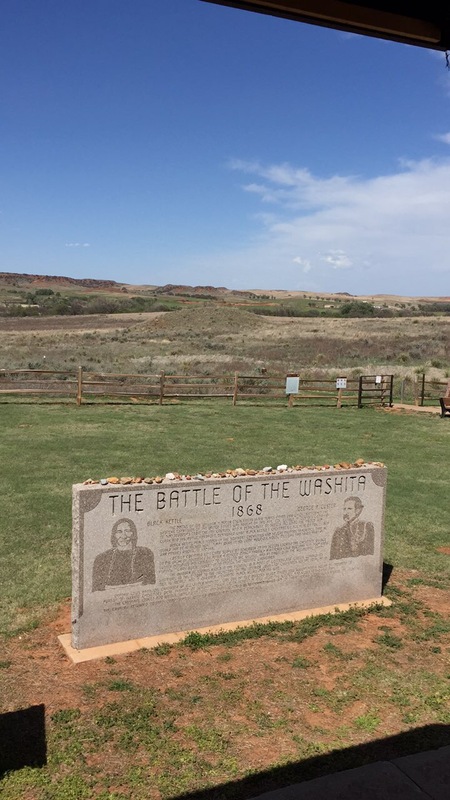 The story of Washita obviously does not end at Sand Creek but it does illustrate that much of the history of U.S.-Indian relations at this time was one retaliation to the next and one massacre at a time. Cheyenne and Arapaho raids of settlements and ranches throughout Colorado continued until the signing of the Treaty of Little Arkansas River in 1865. Chief Black Kettle, the famous Cheyenne pacifist who believed military confrontation with the U.S. would only lead to disaster, negotiated the treaty with federal agents. The Cheyenne relocated into Indian Territory but this treaty did not last long enough for the ink to dry. Black Kettle’s influence began to wane due to his continued pacifist stance despite constant warfare, relocations and Sand Creek. The Dog Soldiers and famed Cheyenne warrior Roman Nose, who did not agree with the treaty’s provisions, raided settlements along the Smoky Hill River in Kansas in 1866. In 1867, Maj. Gen. Phillip Sheridan, a major Union commander in the Civil War who led the 1864 Shenandoah Valley campaigns and harassed Robert E. Lee with his cavalry in the lead up to Appomattox, took over U.S. forces in the west. Also in 1867, Congress appointed an Indian Peace Commission to negotiate a lasting peace. This led to the next in the long line of treaties. The Medicine Lodge Treaty was negotiated between the U.S. and the Kiowa, Comanche, Kiowa-Apache, Southern Cheyenne and Arapaho in October of 1867. The tribes relocated to reservations in Indian Territory to prevent further bloodshed. These reservations were smaller than the ones negotiated in the Treaty of Little Arkansas River and their legality was dubious since the treaty required ratification by a vote of tribal males, something that never occurred. In the end, all the Medicine Lodge Treaty accomplished was delaying the next round of bloodshed into 1868 . Ironically, the Indian Peace Commission published a final report in 1868 that put the blame squarely on the United States for the various conflicts. Cheyenne, Arapaho and Sioux raiding parties began almost immediately along the Solomon and Saline Rivers in Kansas. The summer of 1868 saw raiding across the region from northern Texas to southern South Dakota. Roman Nose died leading a charge against Beecher Island in Colorado Territory in September. In August 1868, Sheridan took direct control of military forces and began planning a winter campaign in Indian Territory. The idea behind the campaign was to strike fast, show the tribes the full extent of U.S. military power and catch them when their horses were at their weakest. One of his commanders, Lt. Col. George Custer, took the 7th U.S. Cavalry through a foot of snow to the Washita River Valley. There 6,000 Cheyenne, Arapaho and Kiowa were encamped for the winter in scattered camps stretching 10-15 miles along the river. 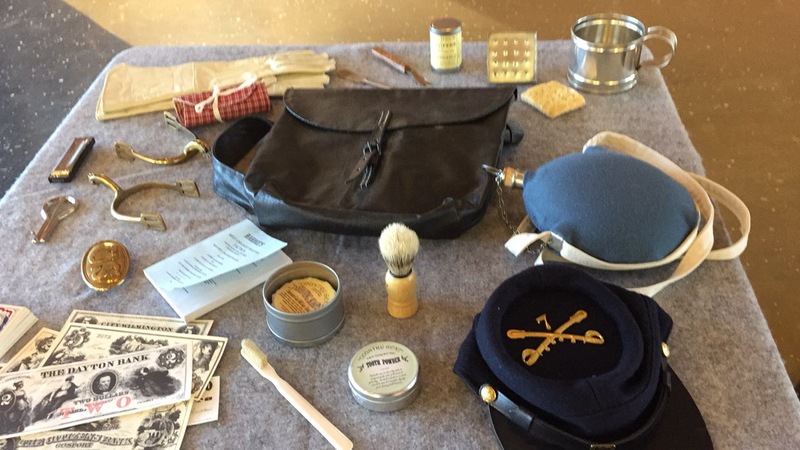 Custer’s Osage scouts discovered the trail of a returning war party on November 26, possibly the same trail left by 150 warriors returning from Kansas to the camps, including Black Kettle’s, that same day. Black Kettle himself returned to his camp on November 27, returning from Fort Cobb where he had been lobbying for renewed peace. Custer, unbeknownst to any of this, took up positions on the night of November 27 after Black Kettle’s return. The Cheyenne were startled awake at dawn the 28th to bugle calls and a military band playing “Garry Owen”. A cavalry charge came splashing through the freezing Washita into the heart of the camp. Charges by Capts. William Thompson and Edward Meyers, whose detachments had already crossed the river to the west, charged from the south. Frightened and barely clothed, the Cheyenne scattered and hid wherever they could. Custer observed the slaughter from a nearby knoll. Maj. Joel Elliott, who had crossed the river to the east of the camp as part of the larger attempt to surround it, pursued the fleeing Cheyenne right into a detachment of warriors from other nearby camps rushing to render aid. Elliott, who had broken formation without permission, and his 20 troops were overwhelmed and all killed. Only one other U.S. solider was killed in the battle. Estimates of Cheyenne deaths range from 13 to 150. Among them were Black Kettle and his wife who were shot while trying to cross the river. In accordance with Sheridan’s orders to cripple native resistance, Custer had his troops kill over 800 Cheyenne animals and burned their lodges and stores. With the reinforcements that had overwhelmed Elliott coming, Custer feigned a second attack and then retreated to Fort Supply with 53 women and children captives. 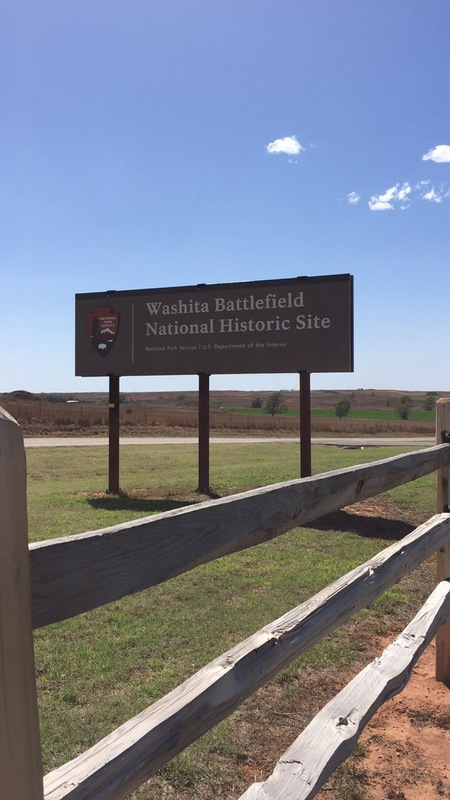 The Battle of Washita hardly ended the American Indian Wars. In many ways, it barely registers as little more than a footnote in the larger timeline. Sheridan’s winter campaign continued until 1869 and saw the destruction of Solider Spring, a Comanche village, and the surrender of many Cheyenne and Arapaho. The Cheyenne Dog Soldiers persisted as a fighting force until July 1869 when the 5th U.S. Cavalry defeated them at the Battle of Summit Springs in northeast Colorado Territory. It was in this battle that 35 warriors died including the Dog Soldier’s leader Tall Bull. Buffalo Bill Coody, a scout with the 5th Cavalry, claimed to be the one to shoot Tall Bull from his horse but it was likely another warrior who just happened to be on Tall Bull’s horse. President Ulysses Grant attempted to institute a peace policy but the conflicts continued. In 1872, the U.S. 4th Cavalry clashed with Comanche warriors and the Red River War began in 1874 as the army attempted to force the Kiowa and Comanche of the Texas and Oklahoma Panhandles onto reservations. The American Indian Wars were essentially over by the 1880’s and the U.S. Census Bureau formally closed the frontier in 1890. From then on, the frontier line, a point beyond which the population density was less than two persons per square mile, no longer existed. Vestiges of the American Indian Wars did linger though they were closer akin to law enforcement issues rather than outright military conflicts. The last conflict between the government and natives on the Great Plains was the 1909 Crazy Snake Rebellion in eastern Oklahoma. The American Indian Wars came to an unceremonious end in 1924 when a band of Apaches crossed into the U.S. from Mexico and stole some horses from Arizonan settlers before sheriffs arrested them. 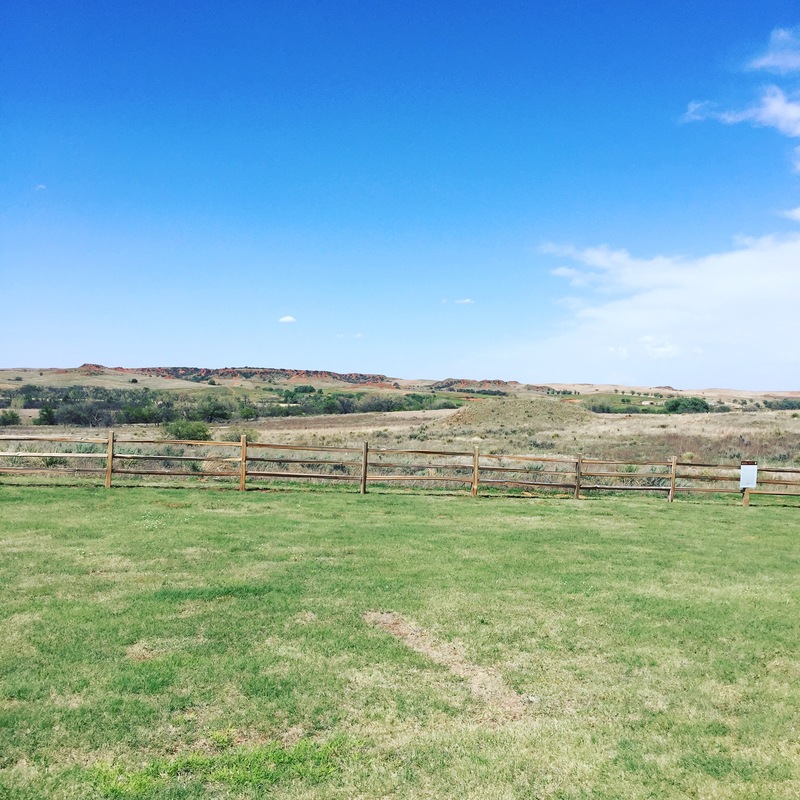 Standing in a windy field where, 150 years before, a few dozen people died in one of the countless raids of the American Indian Wars, you cannot help but wonder about the significance. There are no park units for Soldier and Summit Springs or Beecher Island. There aren’t even state parks or historical markers. What makes Washita special? In my opinion, it is not the strategic significance of the battle. From a military standpoint, there is nothing special about that stretch of riverbank. It is indistinguishable from the other camps that lined that ten-mile stretch that winter. There was no road or bridge critical to movement in the region. Rather, I think it’s what it represents and who was involved. Washita was a tragedy because it was preventable. That same year the Indian Peace Commission blasted the U.S. Government for its dishonesty and greed as the reasons for the perpetual warfare. Keep in mind this isn’t some politically correct commission create a century after the fact, this was a commission created at a time when settlers where being killed by Native American raiders. Can you imagine an inquiry today into terrorism or cartel violence that uniformly says it’s the government’s own fault and they are reaping what they sow? Washita is notable because of the names involved. The U.S. commander was none other than George Armstrong Custer himself. Not only was he a decorated Civil War officer but he gained posthumous fame for his death and last stand at the Battle of Little Bighorn. Opposite of Custer was Black Kettle, a chief so dedicated to peace that he essentially lost all true control over his own tribe. That his death came at the hands of Custer, in a surprise attack, the day after he returned from working on peace terms says everything you need to know about his tragic tale. While Washita might not have been a strategic victory for the U.S., it was a tactical one. The elimination of so many animals and winter supplies, the loss of a chief, the message sent by the surprise attack in the middle of winter; all of these sent a powerful message to the southern plains tribes. The taking of 53 captives to act as hostages for good behavior sends a medieval and clear message in its own right. Before 1868, the tribes refused reservation life and raids occurred from Nebraska to Texas. One of the reason’s Black Kettle lost control over his people was because after the Sand Creek Massacre the young warriors of the Cheyenne were angered enough to fight the government to the end. They knew full well the military odds of their victory but were willing to risk death than surrender to a settled life on a reservation under the control of a government that constantly moved the goalposts. After 1868, tribes began to accept the reservations and the U.S. Army became such a dominant player that the inevitable was only a matter of time. If nothing else, 1868 acts as a crescendo of the American Indian Wars. Before that point, the frontier was a vast and lawless place where the tribes often had the upper hand. After it, the frontier diminished and the Army never gave up the advantage. Ultimately, these three sites are indicative of three distinct eras, all depicting that we are all living in our own epochs and racing against the clock to enjoy the familiar. Alibates is a symbol for ancient man, eking out a living from rocks in complete isolation. Washita symbolizes the transformation of North America from what it once was into what it was to become. The ancient vast isolation of the plains that the Indians enjoyed was suddenly interrupted as the plains were no longer so vast, nor as isolated, as they once were. Lake Meredith symbolizes a new era where a large-scale dam project turns a shallow river into a lake in the middle of arid plains. Think about the perspective with that shift. If you live in Houston, northern Amarillo seems like a world away but you can be there in less than 12 hours if you jumped in your car right now. How long would that trip take a Clovis mammoth hunter? How long would it take Black Kettle? To modern Americans, this whole area is the “middle of nowhere” and that couldn’t be further from reality. Not long ago this region was as isolated and wild a frontier as we had in this country. As we pulled onto I-40 to head back to Oklahoma City we passed through several small towns that were little more than remnants of their former selves. Passing by the aluminum remains of a gas station and the collapsing wooden frames of an old farmhouse you realize that all of that bloodshed and conflict was for nothing. For nearly 50 years, commanders like Chivington, Sheridan and Custer clashed with plains warriors to force them onto reservations so settlement could encroach further and further west. By the 1890’s the frontier closed, Indian Territory became Oklahoma, and settlement beat out the old nomadic ways of life. It didn’t even take a century for all that hard fought work to settle the frontier to collapse in on itself. So many hard fought small towns are now husks. Drugs are endemic. Almost anyone that can leave flees to the opportunity of the cities. As prairie fades into suburbs, you realize the frontier might not be as wild and isolated as it once was but it is still there in its own way. Back in the time of Black Kettle the government was active in the area, trying to solve what it perceived as the major problem in the area: raids on settlers. Today the government is still active in the area tackling drug problems and new forms of danger and lawlessness. In the 1850’s, settlers streamed into the area in search of Coloradan gold. Gold became cattle which became oil. Today the fortune seekers erect countless fields of windmills to pull money from the air. What is Oklahoma City or Amarillo other than a modern version of Fort Laramie or Fort Cobb? Outposts of order in the middle of an area we still struggle to tame. And in a way isn’t that what the frontier is all about? It’s not the romanticism or the census facts, its people fighting for a living and a way of life in the middle of nowhere. What difference does it really make if that person is a flint miner, Cheyenne warrior or roughneck? The Colorado Piedmont being the stretch of plains and rolling hills adjacent to the Rocky Mountains. This is where Colorado Springs, Pueblo and Denver are located. Another note from the Medicine Lodge Treaty, it led to a landmark Supreme Court case in 1903, Lone Wolf v. Hitchcock. Kiowa Chief Lone Wolf sued the federal government stating that under the Medicine Lodge Treaty the tribes had been defrauded due to congressional actions that broke the treaty. Justice Edward White held that the “plenary power” of Congress gave it authority to unilaterally abrogate treaty obligations between the federal government and the tribes. The ruling was a disaster for the tribes. By 1934, approximately 90,000,000 acres, which was two-thirds of Indian lands, had been transferred to settlers.